We're near the end of Frieze, finally. I'm going to start this post off with some art and then I have a few concluding thoughts that follow. And if you are into art fair photos, reports for Pulse and NADA are forthcoming! Good old Barbara Kruger--selling her anti-Wall Street message to the masters of the universe. I can imagine Jamie Dimon buying this and hanging it in the den. After work, he sits down with a brandy and cigar, looks at it with a slight smile, muttering to himself, "Damn straight!". 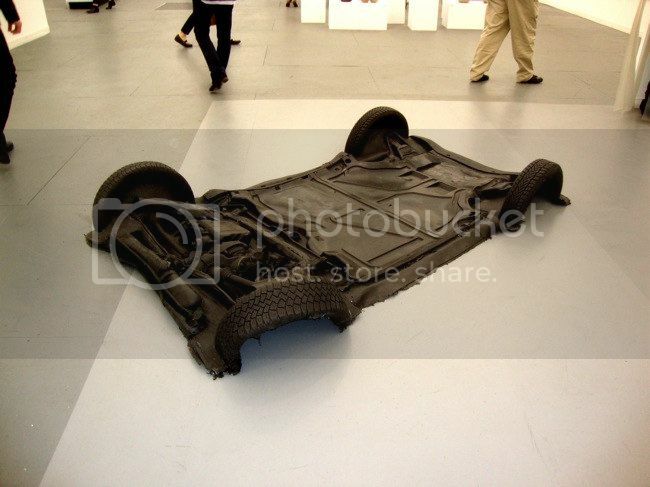 Looking at Asta Gröting, I believe this piece is called Mein smart--a cast in polyurethane of the undercarriage of her Smart car. I like it, and it is typical in a way of much of the sculpture here--floor-hugging. 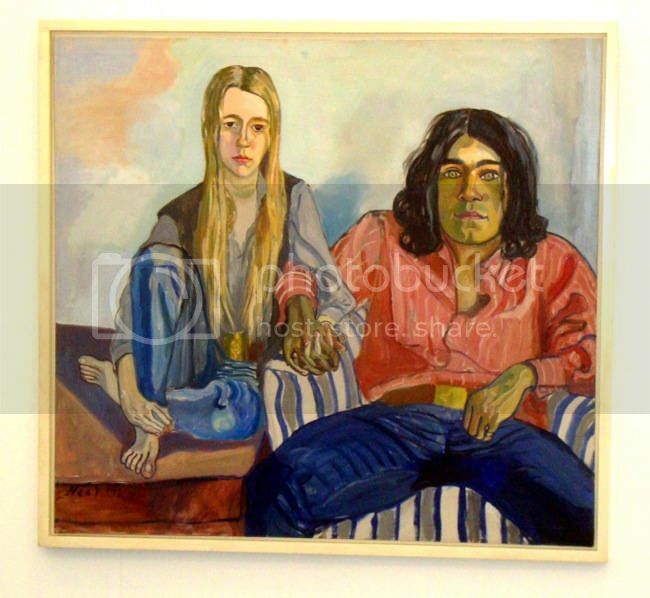 I loved this Alice Neel painting not just because I love Alice Neel in general, but also because I love the dated hippie-ness of it. Ian seems very aggressive, with his legs splayed out, his colorful clothes and the green in his face. Alice, all pale and wrapped up in herself, is far more retiring. 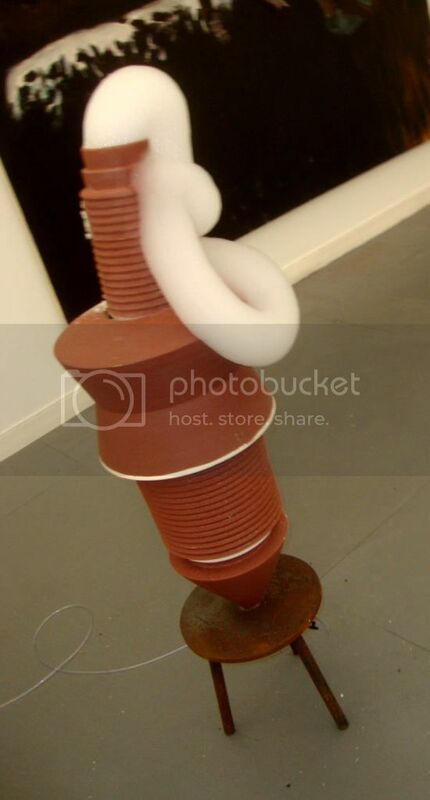 This piece by Roger Hiorns appeared to be some still-like device for producing foam. The foam was quite thick, as you can see. I'm afraid I don't know who did the art in the next two photos. Pan readers, here's another quiz. No prizes, except for the gratitude of your humble blogger. Who did these pieces? I think I saw this large floor piece at Stuart Shave. I think this may be by Cildo Meireles. 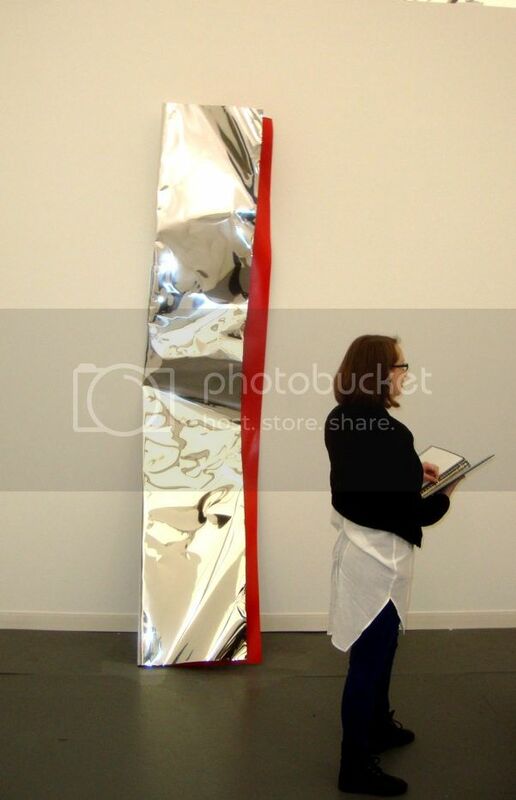 It was in the Galerie Lelong booth. I'm going to close with a quote from Felix Salmon, a financial writer at Reuters who often writes about art. He asks (and answers) the obvious question--why is it that galleries set up at art fairs but not artists representing themselves? It’s fascinating to me that the imprimatur of high prices is still conferred almost exclusively on those artists with high-profile gallery representation. You’d think that the internet — a medium made for disintermediation — would by now have done a spectacular job of cutting out the middleman and allowing branded artists to sell directly to awed collectors. But that hasn’t happened, and galleries continue to happily introduce big-name collectors to their top artists, comfortable in the knowledge that neither artist nor collector is likely to try to do a deal behind the gallery’s back. Another "branded" artist without gallery representation is Michael Tracy. From what I hear, he just has house exhibits for his devoted collectors. This is how Houston painter Richard Stout makes his living as well. Given this, it doesn't seem totally crazy for some artists to just buy their own booths. 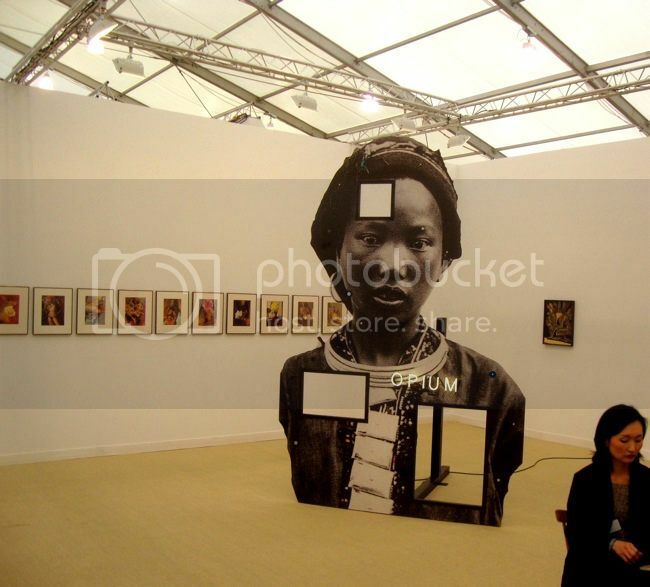 Especially at a fair like Frieze that is curated by the organizers. 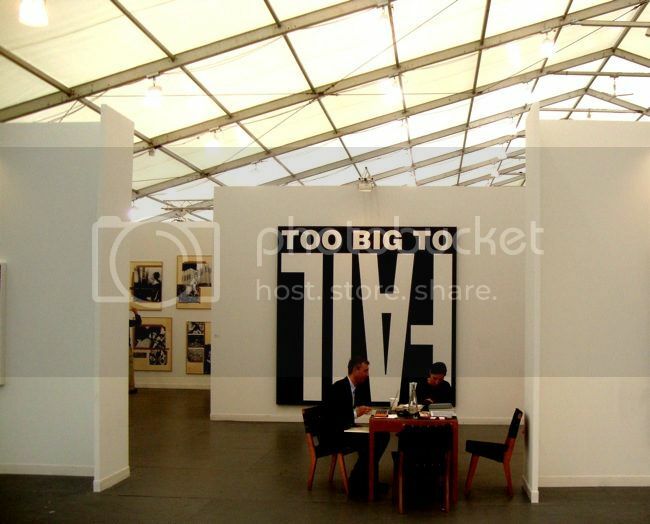 They could ensure only highly salable artists got their own booths and that only work likely to move would be exhibited in them. But I think what Salmon (and Don Thompson) call branding and what Pierre Bourdieu called cultural capital is still important. This means that showing in a gallery confers cultural capital onto an artist, and buying from a gallery confers cultural capital on the buyer. The gallery, in a sense, guarantees quality. But why should Frieze care? 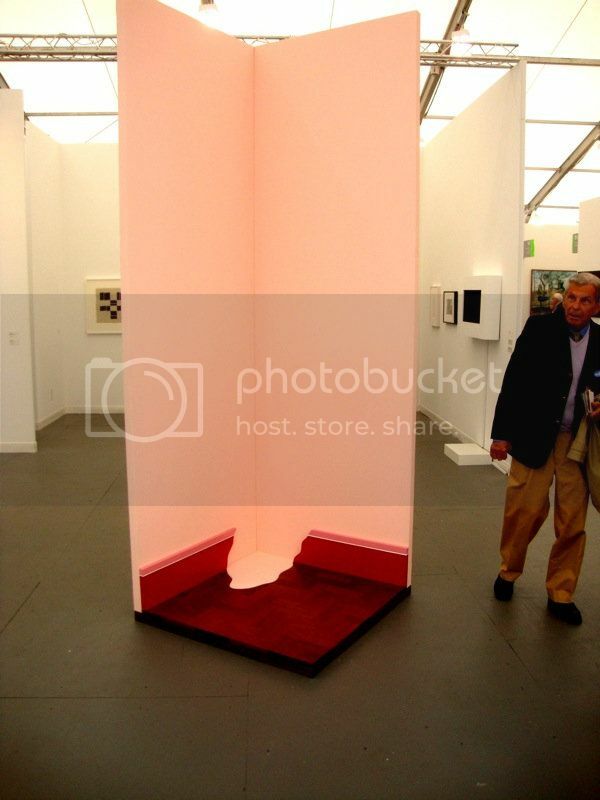 If Bruce Nauman wanted to purchase a booth, why not let him? The reason Frieze cares is because the galleries are their clients. So they can't offend their primary clients. But what might be possible would be for a group of well-off blue-chip artists to put on their own satellite fair. That would be interesting.